Just watching them graze, jump and play brings me such happiness. It also brings me such sadness for those who will never live the life they were meant to live. Christine Mariani Egidio, 57 years old, from New Jersey U.S., has always been an animal lover, both when she ran her farm where sheep were bred and sold for their meat and also when she decided not to have animals slaughtered anymore and let them live a full and long life. But what changed that made her decide to stop selling sheep meat, rescuing other animals and even starting her own Chicken sanctuary? Her inspiring story is one of compassion and love for animals over the habit and personal taste for food. In April of 2009, my husband and I purchased 32 acres and decided to breed and sell sheep meat to help pay the mortgage and to provide income after we retire. I purchased three breeding Tunis ewes and a ram. I am horrified to admit that my motto about our sheep breeding business was, “They have a really great life, up until they no longer have one.” I wholeheartedly believed in the “humane slaughter” myth. 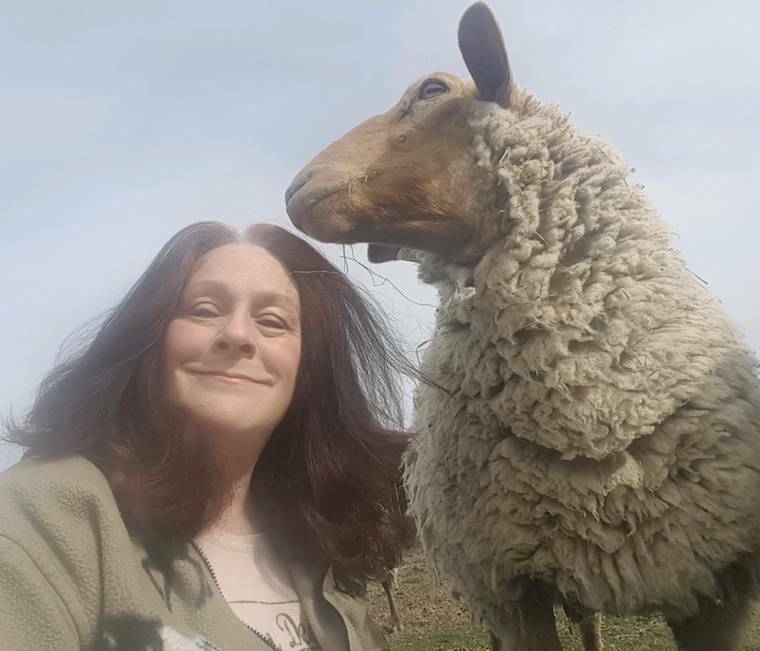 Even though I soon learned that sheep all have individual personalities, are SMART, and definitely form bonds with one another, show joy, fear, friendship; every human emotion, I still did not make the connection. I have always been an animal lover, rescuing dogs, cats, horses, but I still did not make the connection that farm animals are no different in their desire and right to live. We bred sheep for three years. During that time, I lost a few sheep and several lambs during labor and I cried over each loss - but still - I didn’t allow myself to see that what I was doing was wrong. I’m married and have two sons. At that time, we were all on the Primal Diet (similar to Paleo), so we were eating more meat than anything else. I always tried to buy organic, grass fed, but it was hard to find in our area and it was very expensive. So my youngest son got the idea that we should raise pigs, turkeys and chickens for meat (we already had hens for eggs). He was also an animal lover, so he suggested that in order to make sure that the animals were not mistreated during slaughter, and in order to not cause them stress hauling them from our place to the butcher, he would learn how to slaughter them himself. He felt that if he could do it very calmly and not be rough with the animals, they would not be afraid because they would know him, and that would make it okay. And he told me, no, that he had watched a video of pigs being “humanely” slaughtered by a person they knew, who was handling them gently and calmly, and the pigs were still panicking, trying to get away, and the other pigs in the pen knew what was going on and were screaming and trying to escape. He then very simply said, “Mom, they don’t want to die.” Such a simple sentence, but so profound. Because that’s it in a nutshell, isn’t it? All of the arguments people have against veganism come down to that one fact…the animals don’t want to die. I had never personally known anyone who was vegan. I truly believed what I was taught, that humans NEED to consume meat/milk. But I was haunted by my son’s words - that the animals don’t want to die, so I decided to give up meat. For about three months, I still used dairy and egg products. But then one day, I saw a post on Facebook about the dairy calves being dragged away from their screaming mothers, and it suddenly CLICKED and I became fully vegan. We had 23 sheep at the time we stopped breeding, and most were re-homed to sanctuaries and vegan families, but eight are still here with us. Just watching them graze, jump and play brings me such happiness. It also brings me such sadness for those who will never live the life they were meant to live.